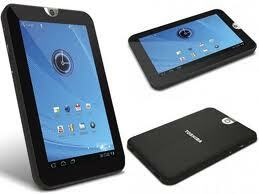 Toshiba has recently announced a smaller version of their Thrive Tablet. According to their released details this 7inch model has the same hardware configuration as present in their earlier 10inch model. Carl Pinto, Vice president of product development, Toshiba America Information systems, Inc., Digital Product division, stated that Thrive 7 is the first seven inch tablet in the US market to offer a true HD display. He even added that with its features like the selection ports, premium audio, and a better, more robust Android experience make this device a great choice for the customers. Thrive 7 has a 7-inch LED backlit AutoBrite capacitive multitouch display which supports a resolution up to 1280 x 800pixels. It is powered by Android 3.2 Honeycomb platform and a Tegra 2 dual core processor which is also present in the 10inch model. For storage this model will have a two option of 16GB or 32GB. Some of other specifications of the Thrive 7 include a selection of built- in ports like the mini-USB, micro HDMI, and micro-SD card slot to increase its memory capacity. This model is also provided with a rear camera of 5megapixels and a 2megapixel camera to its front for video calling. For a greater multimedia experience it is also provided with a stereo speaker tuned with sound enhancement technologies. This 7inch tab is only 12mm (0.47inches) thick and weighs around 400gm (0.88pounds) along with the battery. The model is announced to be made available in December, although the exact date is not specified; even no comment has been made regarding the price.